I still cannot understand why the topic is true. The feasible region for $Gx \preceq h$ is a polyhedron, which is easy to understand and can be easily drawn on the paper. The feasible region for $Ax=b$ is the intersection of all affine set defined by $a_i^Tx = b_i$ for each $i$, where $a_i, \forall i$ are rows of $A$. So there are three possibilities: 1. No solution. Then the feasible set of LP is empty. 2. One solution. Then the feasible set of LP is "at most" a point. 3. $\infty$ solution. Then the feasible set of LP is "at most" a line. Why is the feasible set a polyhedron? The feasible region for $Ax=b$ is an intersection of affine sets, therefore also an affine set. However there are no further restrictions on the dimension of the solution space for $Ax=b$. It may very well be two- or higher-dimensional. Not the answer you're looking for? 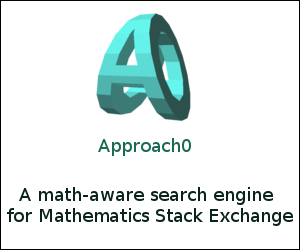 Browse other questions tagged convex-analysis convex-optimization linear-programming or ask your own question. 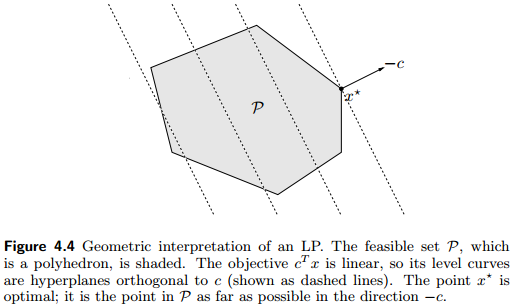 Find the edges of a polyhedron P.
Why is it necessary to have convexity outside the feasible region? In convex optimization, must equality constraints be linear or affine? How to show that the convex hull of a set describes a polyhedron? Why is this set not a polyhedron?